Grits and Groceries: Anthony Stemke: FRUIT FOR DINNER? Years ago I used to eat breakfast at a diner just outside New Orleans. Most times I would get a breakfast sausage patty with my meal and I always enjoyed using those little jellies on the meat. Recently I got to thinking about fruits and meats cooked together when I made a piccadillo and added the obligatory raisins. Well, a lot of situations call for fruits and they make a valid contribution. You eat cranberry sauce with Thanksgiving turkey, right? There are lots of examples of fruits used for dinner foods. 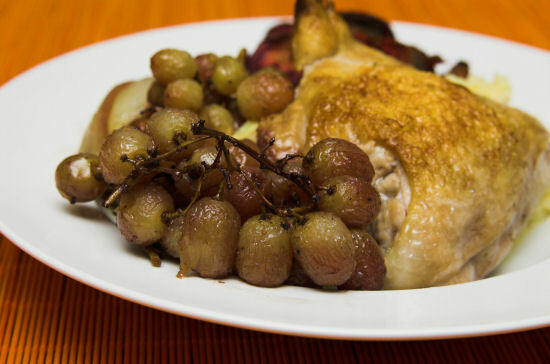 Not just duck a l’ orange, but applesauce with pork chops, just to name a few. Thirty years ago, Jinx Morgan wrote an article in Bon Appétit magazine about meats with fruit. The photos were very beautiful (by D.E. Wolfe), and the first one I tried got me hooked. It was called mandarin teriyaki. Others were pork chops with cherries and peach glazed leg of lamb and a few others. They were all excellent recipes. Since then I haven’t seen a lot of new fruit/meat combinations, which is a shame. I am going to try a meatloaf made with horseradish and chopped apples soon. I think meats with fruit should be more popular. In the meanwhile, here is that mandarin teriyaki recipe, which serves 4-6. 1 Combine the first five ingredients in a mixing bowl. Add beef and marinate for 2 hours, stirring several times. Remove beef and pat dry with paper towels. Discard fresh ginger, reserve marinade. 2 Heat one tablespoon of oil in wok or skillet and brown half the meat. Remove to warm dish. Heat second tablespoon and brown remaining beef. Remove to the warm dish and pour the ½ cup marinade around it, reserving the rest. 3 Place onion, green pepper and pineapple juice in the wok now and allow it to simmer for 5 minutes. 4 Meanwhile, in a small saucepan, combine reserved marinade with the cornstarch, stirring till thickened. Do not boil. Stir the cornstarch mixture into the vegetables. Throw in the beef and orange slices and cook just till heated. Serve over steamed rice.